Click to watch a three minute video from the history channel describing the impact of J Robinson. Jackie Robinson made history in 1947 when he broke baseball’s color barrier to play for the Brooklyn Dodgers. A talented player, Robinson won the National League Rookie of the Year award his first season, and helped the Dodgers to the National League championship – the first of his six trips to the World Series. In 1949 Robinson won the league MVP award, and he was inducted into the Baseball Hall of Fame in 1962. Despite his skill, Robinson faced a barrage of insults and threats because of his race. The courage and grace with which Robinson handled the abuses inspired a generation of African Americans to question the doctrine of “separate but equal” and helped pave the way for the Civil Rights Movement. 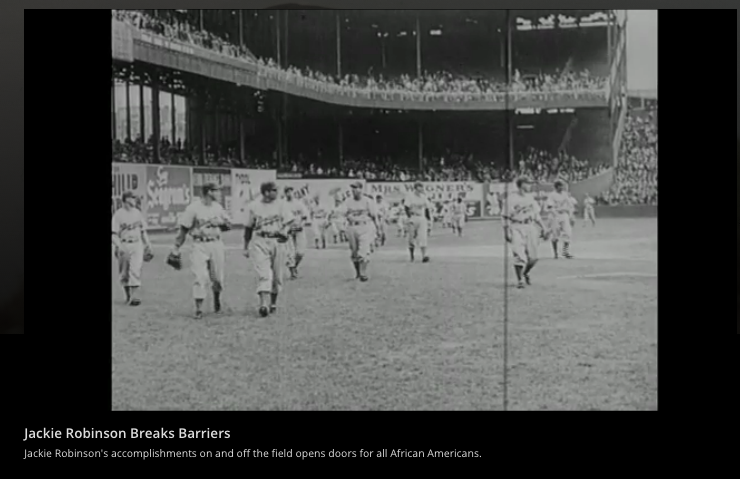 Source: History.com, history.com staff, 2009, Retrieved from ​http://www.history.com/topics/black-history/jackie-robinson_, Publisher, A+E Networks. ﻿Students will read an interactive article titled “About My Father”, by Sharon Robinson. Interactive vocabulary words and definitions will pop out as students scroll over them. Students will be expected to select 5 vocabulary words to record in their reading journals for use in the trading card activity. Students will also respond to one pop out question of their choice (three options available) by responding to the corresponding blog question on the google site. 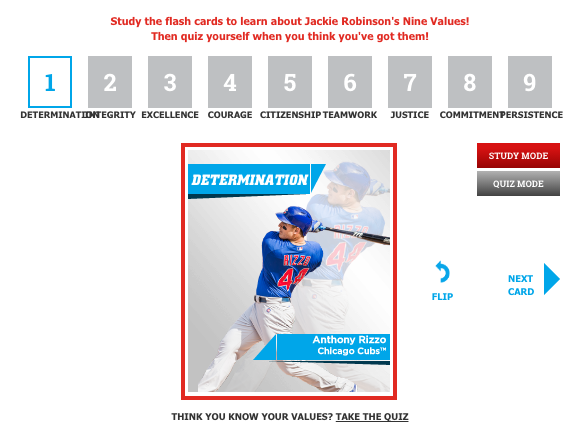 ﻿An interactive lesson called “Values and Barriers” provides 9 interactive flash cards that explain Jackie Robinson’s Nine Core Values. Students will explore these nine values in both study and quiz mode. 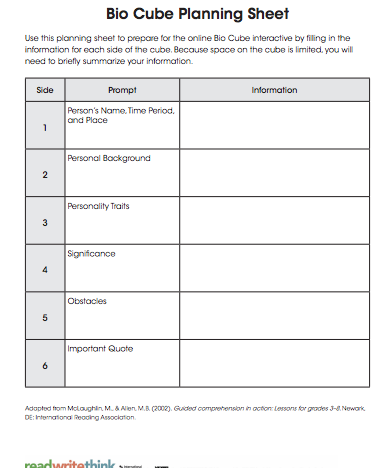 ﻿Students will begin with the Bio Cube Planning Sheet, which they will use to collect their research. The information required ranges from basic background, such as name and place, to more probing subjects, such as personality traits, significance, biggest obstacle, and important quotation. Once the sheet is complete, children can transfer the information online by clicking on the six numbered blocks and filling in responses. From there, the template can be printed, folded, and taped to form a cube. End of Project Survey: To help students reflect and provide data for the teacher to revise the unit for future classes, a survey was created for the end of the unit. This Google form survey can be found at https://www.surveymonkey.com/r/NPGJSWW.